Best practices that address both personal wellness and work-life balance through active design. 10 Post Office Square, Boston, designed by Dyer Brown. Photo by Darrin Hunter courtesy Dyer Brown. Of the predominant trends now driving workplace design, two epitomize the aspirations of millennials and other younger workers: personal wellness and work-life balance. So for employers looking to attract and retain talent, creative ideas in making environments that support healthy, happy lifestyles are more than valuable. They are a key to long-term growth. Investments in health and happiness actually pay off – not only through staff retention but through documented reductions in absenteeism and healthcare costs and proven increases in productivity. In fact, Global Wellness Institute calculates the downside of “unwellness at work” for the U.S. economy at $2.2 trillion annually, or 12 percent of GDP. “Workplaces combine multiple pathways for health risks – from exposure to indoor pollutants to lack of physical activity during work hours,” according to the nonprofit Center for Active Design. Of the average 1,700 hours per year that U.S. workers spend on the job, an increasing share are spent in wellness-related activities and environments. Over time the trend should boost employee health – and public health. Active design works for all budgets. The basic idea behind active workplace design is to encourage movement, stimulate physical action, and vary worker postures throughout the day. This demands a rethinking of our offices and work areas, not merely commodity purchases (such as FitBits or treadmill desks) or an expensive intervention (like a connecting stair between two floors of a facility). Everyone may want the gadgets or a mezzanine café, but the first steps involve policies, programming, and personal options. A connecting stair at the headquarters of Crimson Hexagon, a social media analysis software company, designed by Dyer Brown. Photo by Darrin Hunter, courtesy Dyer Brown. Encourage variety in settings, spaces and postures. Another primary concern for active workplace design emerges in the choice and configuration of furnishings, fixtures and equipment. The big takeaway: Variety encourages activity. As an example, Dyer Brown has researched and designed meeting spaces for clients like Fresenius Medical Care in Waltham, Mass., with deliberate choices to design around touchscreen monitors, make conference tables smaller and moveable, and use a mix of both lounge-style furniture and bar-height table options, so participants can choose to sit in an alternate posture or even stand for their weekly meeting, if desired. In this way, a conference room allows for varied postures and movements which keeps people focused and energized. Create reasons to be active. The design of a workplace can only do so much; people need inducements to active behaviors and the destination places and postures that are healthy. 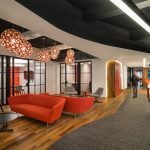 So good workplace designs and organizational policies entice people with varied spaces, such as private phone booths or al-fresco terraces, with programming and layout ideas that encourage lingering. In a workplace designed by Dyer Brown in Dallas, for example, we located fresh and made-to-order food offerings in the main public-facing café, while smaller satellite cafes on each floor had only water and standard coffee. Every day, employees from multiple floors and facilities descend on that main café to get the best espresso (a major draw) and connect with colleagues. Informal seating at 1 Boston Place, designed by Dyer Drown. Photo by Darrin Hunter courtesy Dyer Brown. Daylight offers the best payoff. Good coffee is a draw for some. But windows and sunlight offer the strongest inducement for moving from one place to another. A new survey of 1,614 North American employees by HR advisory firm Future Workplace reveals that “access to natural light and views of the outdoors are the number one attribute of the workplace environment,” preferred even over such amenities as fitness centers, cafés, and on-premises childcare, writes Jeanne C. Meister in Harvard Business Review. So to make workplaces more active, why not locate occasional seating near natural light? Or place sit-stand desks along perimeter windows to reward their users? That is a low or no-cost strategies that can be implemented quickly, when you may not have the cash to build a new patio. A sit-stand desk – near the window, a preferred place – at the head office of a consulting company, designed by Dyer Brown. Photo by Darrin Hunter courtesy Dyer Brown. Pick the low-hanging fruit – and don’t stop there. Speaking of sit-stand desks, we’re seeing lots of them across the country, and for good reason: They’re inexpensive and easy, the lowest-hanging fruit of active workplace design. The buyers still need to invest in the higher goals of improved layouts and activity-based work, but their low-cost quick fixes are a good place to start – for example, moving the vending machines and bottle fillers, or cutting the number of printers or office supply closets. Form a committee to propose and implement the next round of changes, and take anonymous suggestions. New to active design? Try certification. Not everybody knows Fitwel, a facility rating program launched two years ago as an organized standard for healthy facilities. Operated by the Center for Active Design globally and with UL overseas, Fitwel is a low-cost standard “enabling positive impacts on building occupant health and productivity through improvements to workplace design and policies.” Arup and Dyer Brown employed Fitwel for Arup’s own Boston headquarters, and it made wellness easier to document and achieve. The Boston office of Arup, the first office to receive WELL Certification in New England at any level, is also designed to Fitwel 3 Stars and LEED v4 Platinum. Photo by Darrin Hunter, courtesy Dyer Brown. To boost active design effectiveness, firms can assist clients in exploring and implementing strategies that support both WELL and Fitwel certification. It also helps to encourage architects and designers to incorporate the Ambassador course or WELL AP exam into their professional development. Ideally, projects should be certified to WELL or Fitwel standards: The main benefit is a third-party validation through certification and endorsement of the principles behind the workplace designs – and it provides a way to demonstrate real and provable impact. Even employing some strategies from one of those programs is a great start, and they don’t have to be cost prohibitive. In almost all cases, there are small but meaningful changes available during the design process that will set the project on the right path. New amenity areas at 88 Black Falcon, a three-story complex of maker space and tech-ready offices at the tip of the booming Seaport District on Boston Harbor. Photo by Darrin Hunter, courtesy Dyer Brown. The big benefit of proven active design solutions is not just that they’re “cost-effective and widely implementable, but they are also capable of providing measurable outcomes,” says Center for Active Design. Employers can count on the bump in productivity, and employees get the quality-of-life enhancements they seek. The words active design might conjure images of middle-aged, sedentary workers in some circles, but the reality is decidedly different. The well workforce is a $1 billion business and an emerging demand-side opportunity for our clients. It’s as youthful as it sounds, especially attractive to the class of workers who grew up in an era with a strong focus on wellness.